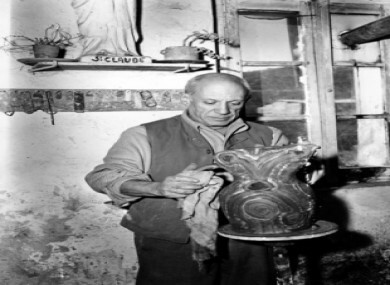 Pablo Picasso, 66, paints an urn in the pottery workshop of Madame Ramie at Vallauris on the French Riviera, 1948. A RETIRED ELECTRICIAN in France has stunned the global artistic community by revealing 271 previously unknown works by one of the most celebrated artists of the 20th century, Pablo Picasso. The collection, hailed as a “treasure trove” by art buffs, includes lithographs, cubist paintings, notebooks and a watercolour painting. It is said to be worth approximately €60 million. Electrician Pierre Le Guennec, 71, installed burglar alarm systems at several of Picasso’s houses in France over a number of years before the artist died in 1973, the BBC reports. Le Guennec says that Picasso gave him the works as gifts – and that he had kept them safe in his garage. He approached Picasso’s son Claude in September in the hopes of getting the works authenticated. However, Claude Picasso has rejected Le Guennec’s story about he came into possession of the art works. He explained that while his father was a generous man, he made a habit of dedicating and signing all pieces he gave away as gifts – he also said that he would never have given so many works of art to a single person. To give away such a large quantity, that’s unheard of. It doesn’t add up… It was a part of his life. The administrators of Picasso’s estate have now filed a case for alleged illegal receipt of the works of art. Picasso produced more than 20,000 works of art during his long career, according to New York’s Metropolitan Museum of Art – however hundreds have been listed as missing, in part because he was so prolific. Email “271 undocumented Picasso works found ”. Feedback on “271 undocumented Picasso works found ”.